Mort Künstler Hand Signed and Numbered Limited Edition:"None to Caress"
Image Dimensions: Limited Edition Print Image size: 25 ½" x 17" • Overall Size: 31 ½" x 22". Canvas Sizes: 27" x 18", 32" x 21" , 22" x 39" and 56" x 37". About the Edition : Last year, I visited beautiful Staunton, Virginia searching for a landmark building that I could use as a backdrop for a painting. Of all the places in the Old Dominion that I had portrayed over the course of my career, I had never painted Staunton in any of my Civil War pieces. With such a rich history, Staunton's time was long overdue and I was very pleased when I came across the main building of Mary Baldwin College. This discovery initiated a series of events that led to this new painting, number V in my final series on the War Between the States. Originally founded in 1842 as the Augusta Female Seminary, the school was renamed Mary Baldwin Seminary in 1895 in honor of Mary Julia Baldwin, one of the institution's first students and its principal during the Civil War. The stately Main Building, located at the corner of Frederick Street and New Street still stands intact and in use, appearing much as it did during the war years. The title of the painting comes from a vivid account penned by Cadet B. A. Colonna of VMI of an event witnessed on the school grounds during the McDowell Campaign in the spring of 1862. 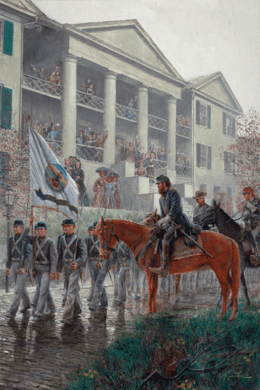 This extraordinary event took place when Confederate General Thomas "Stonewall" Jackson, a particularly favorite subject of mine, reviewed the Cadet Corps at the site of the Mary Baldwin Seminary. Fortunately we have the words of young Cadet Colonna, a firsthand participant who was emotionally moved by the memory enough to write a bittersweet account of a song that was performed on the occasion. Those mournful lyrics resonate and inspired the title of this painting. The entire story of the cadet review was provided to me by the always-helpful Col. Keith Gibson, Director, Virginia Military Institute (VMI) Museum System. My dear friend, Dr. James I. (Bud) Robertson, Jr., the world's foremost authority on "Stonewall" Jackson, also provided me with additional information and the basic idea for this painting. 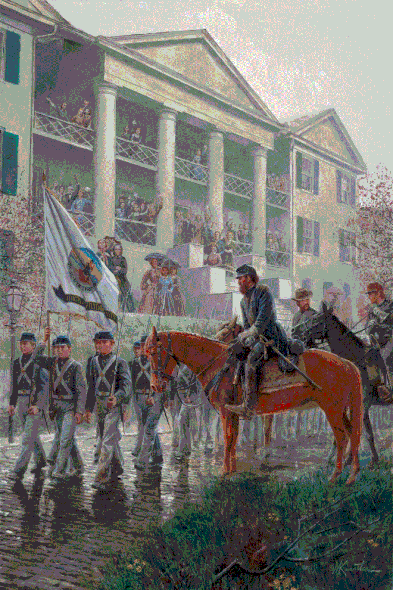 In his great biography of Gen. Jackson, Bud writes, "…on May 5 Jackson derived additional pleasure as the VMI cadets - some 200 strong - marched into Staunton in uniformed splendor. Not even a cold rain on the first day's march spoiled the nattiness of their dress. Perhaps seeing the meticulously outfitted cadets made Jackson aware of his seedy appearance." One can only imagine the cheering and joy from the students at Augusta Female Seminary as the handsome young cadets marched by! Yet the romance of the moment was tempered by the harsh reality that with all the cheering girls so near, the cadets were marching off to war. "No one to love, none to caress…" How ironic. How true! This is likely the last painting that I will ever do of "Stonewall" Jackson and the VMI cadets and I sincerely hope you enjoy it as much as I did creating it.